Physicists have theorized for over a century that light acts as both a particle and a wave, depending on the conditions, but they've never been able to capture it being both at once — until a team in Switzerland did just that in a recent experiment. Scientists at the Ecole Polytechnique Federale de Lausanne managed to take a snapshot of light in all its elusive wave-particle duality, a form first proposed by Einstein in 1905. It was no easy task: You need light in order to take pictures of things, but how do you take a picture of light itself? The EPFL team, led by Fabrizio Carbone, started by exposing a tiny metallic nanowire to a pulse of laser light. The light travels up and down this wire and interferes with itself, forming stationary "standing waves" and illustrating that portion of light's dual nature. At the same time, though, those waves are made of innumerable photons. This was shown by barraging the standing waves with electrons — some of which would speed up, and some slow down, depending on how they strike photons in the stream. 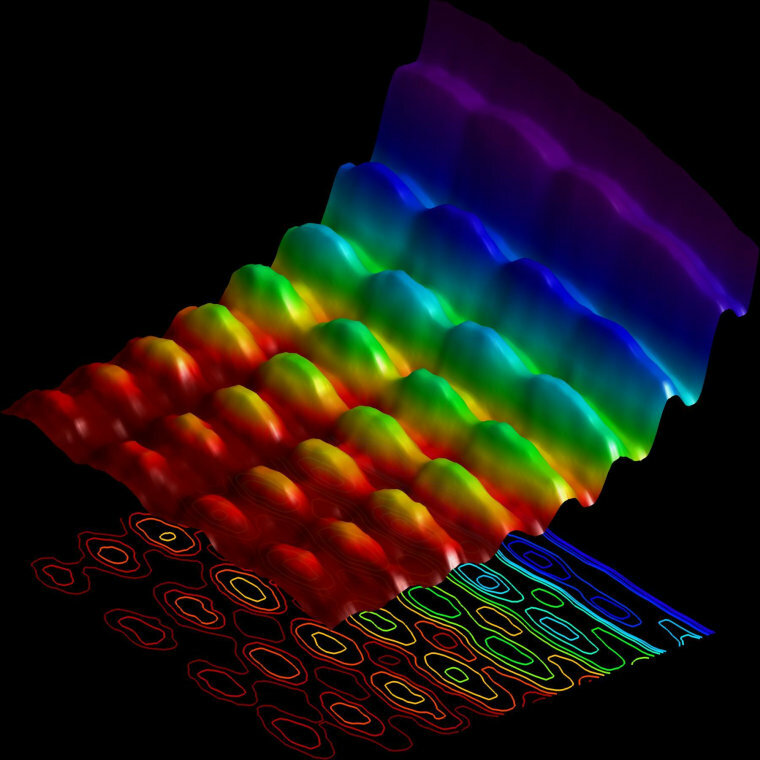 The simple fact that these "quanta" of exchanged energy exist proves that there are particles there, not just a simple waveform of radiation (like a magnetic field). The result is the image above, which shows light exhibiting wavelike and particle-like properties at the same time. This research, published in the journal Nature Communications, significantly advances our understanding of how light works on the smallest detectable scales, and may be highly valuable in the field of quantum computing.